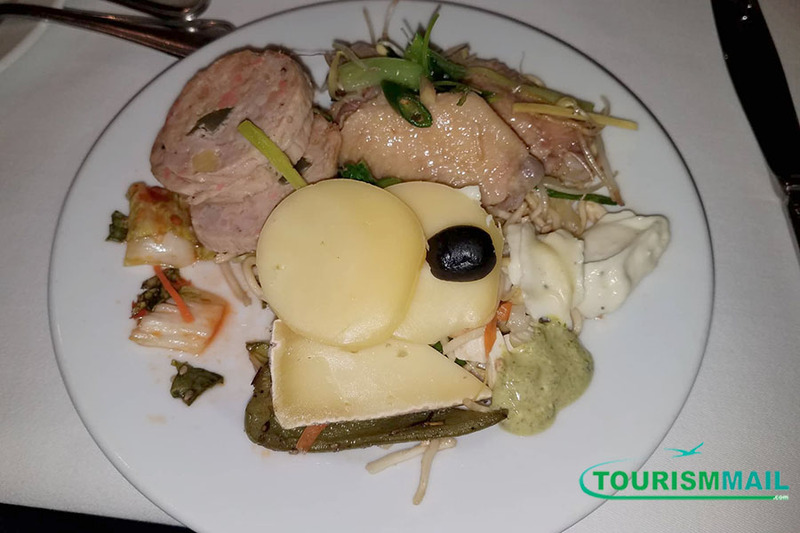 KATHMANDU, Feb 08: Holiday makers arriving in Nepal to spend the Chinese Lunar New Year, or Spring Festival here and local foodies are being treated to a gourmet-fest as the majority of five-star hotels are offering exclusive Chinese cuisine. Visitors staying at the Hotel Hyatt Regency, one of the country's premium hotels located near the famed Boudhanath Stupa World Heritage Site, relished the atmosphere as if visiting a top-rated restaurant in a Chinese city on New Year's Eve. "As with every year, we have specially decorated our restaurant with red lanterns and are presenting authentic and exclusive Chinese cuisine for the New Year. Our guests love both the ambiance and the taste," Mohini Shrestha, Marketing Manager at the Hyatt Regency, told Xinhua this week. The five-star Radisson Hotel in Katmandu is doing the same by organizing a two-week long special Chinese food festival from Jan. 25 to Feb. 8. During the opening of the festival, the hotel collaborated with the China Cultural Center in Nepal and presented various performances including dances, songs, acrobatics and magic shows. Subrata Banerjee, the general manager of the hotel said at the function, said "the motive of the festival is to enhance and promote Chinese food and culture and highlight its impact on a global scale." She further explained that China's food diversity and evolution over the years has made a profound impact on Nepali people's perception of food and daily eating habits. The first five-star hotel of the country, Hotel Annapurna has also launched a special menu targeting the Spring Festival. Santosh Subedi KC, the head chef of the hotel's separate Chinese restaurant called the Arniko Chinese Room, who worked in Dubai for 15 years, has been working in Hotel Annapurna for the last three years. He is mostly focused on preparing Sichuan and Cantonese dishes and is experienced when it comes to serving a wide range of visitors. KC told Xinhua recently, "During Spring Festivals in the past, we had prioritized Indo-Chinese dishes, while this year, we are trying to present an authentic yet diverse menu." The top-rated Soaltee Crown Plaza hotel, which has a Chinese restaurant called Bao Xuan Restaurant, imports raw materials for its Chinese cuisine, including rice, flour, seasoning and sauce directly from China. Dhan Kumar Limbu, the master chef who has clocked up 24 years of working in some of India's biggest and most reputable hotels, explained that he uses only fresh vegetables from the local market while other items are bought from China by air to maintain an authentic taste. Generally, he prepares three types of Chinese cuisine, including Sichuan, Hunan and Cantonese. But for the Chinese Lunar New Year, he has introduced more varieties by merging the dishes from three countries. "We are presenting food from China, Thailand and Japan together in a unique way. I feel it is quite interesting to present signature dishes of different countries together," 42-year-old Limbu told Xinhua. The hotel, which often hosts international events and seminars, said that it is enjoying a good flow of Chinese tourists during the festival. Meanwhile, Pratiksha Basnet, marketing executive at Hotel Soaltee Crown Plaza, told Xinhua, "From Feb. 1 to Feb. 10, considering the Chinese New Year period, at least 20 to 25 Chinese guests will be staying at our hotel every day." As Chinese people travel to different countries during their Spring Festival holiday, a large number of people choose Nepal as their destination of choice. The high-end tourists stay in five-star hotels, while the majority of travelers prefer the Thamel tourist hub. China is the Himalayan country's second-largest tourism market. A record 153,602 Chinese tourists visited Nepal in 2018, a rise of 46.8 percent compared to 2017.